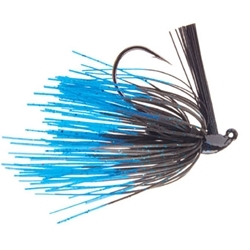 Santone's Rattlin' Jigs feature unique chip resistant powder-coated stand-up heads, a silicone skirt, dual rattle system, and a heavy-wire 5/0 Gamakatsu Hook. Each jig also features a trailer keeper to ensure your placement of your soft plastics. The stand-up head allows the jig to have a natural presentation when it comes to rest on the bottom while the silicone skirt delivers maximum action.